Studies regarding the allergy protection provided by probiotics are mixed: while some studies have indicated that probiotics can provide allergy protection later in life, others have indicated that very little benefits are received, if any. A recent study, published in the Journal of Allergy and Clinical Immunology falls within the latter group. Allergies occur when the body reacts to a substance that is generally considered benign. Allergic reactions can range anywhere from mild congestion to anaphylactic shock – a severe allergic reaction that comes on quickly and can result in death. Probiotics are live microorganisms, generally bacteria, naturally found within the gut. They are important for intestinal health. Often added to foods like yogurt and fermented milk, it has been theorized that probiotics can help curb allergies in children if given early enough by improving normal immune function. Unfortunately, researchers in Australia have found this theory to be inaccurate. Researchers recruited 123 children at infancy. All of these children were considered to be at a high risk for allergies because their mothers suffered from allergies. Through random selection, researchers assigned half of the children a daily probiotic supplement (Lactobacillus acidophilus, the most commonly recommended probiotic for allergy protection) for the first six months of life. The remaining children were given a placebo. 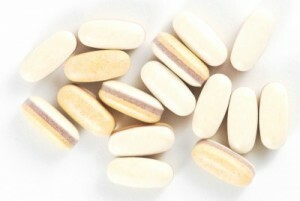 Probiotics or placebos were also given to mothers to take during the last month of pregnancy. Children were tracked from infancy to age 5. In the earlier evaluations, done between 1 and 2.5 years, researchers found no benefits in taking the probiotics. The most recent evaluation, conducted at age 5, still fails to find any benefits. Of the 66 children who had been given a probiotic during infancy, 44 percent still had some type of allergy, such as nasal allergies, food allergies or asthma. This was compared with 38 percent of the 57 children who had received a placebo during infancy. In particular, one study found that only children who had been born via C-section benefited from probiotic supplementation. Additionally, some studies have found that babies born via C-section are at a higher risk for allergies and asthma. Because babies are not exposed to the good bacteria found in the mother’s birth canal, it is thought that this affects the infant’s allergy risk. Still, she says that the results in this and other studies regarding allergies and probiotics is alarming, especially considering the fact that some studies have found that probiotics can help with eczema – a type of skin allergy. She did point out, however, that those studies used different strains of friendly bacteria, not just Lactobacillus acidophilus. In one study, L. rhamnosus GG was used. A probiotic mix was used in the other. But even in these and other positive studies, the benefits of probiotic supplementation seem to be minimal at best. Can Childbirth Cause Post Traumatic Stress Disorder? Featured Review ~ Make Room For One More With The Britax Stroller Board!